In this article, we will discuss aircraft seat design and how all of us at Dretloh Aircraft Supply tirelessly work toward designing better seats. Dretloh leadership regularly attend events and conferences to engage with other aviation experts and maintenance professionals worldwide. These events include: MRO Americas, ACPC Conference, and The Aircraft Interiors Expo. In recent years, airlines have been getting a bad reputation for packing more and more passengers into their airplanes. Travelers are disgruntled and unhappy. From a business standpoint, it boils down to simple math, smaller seats equal more of them and usually leads to increased revenue. How can we improve the flying experience for travelers? Can better aircraft seat design make our clients happier loyal customers? In 2011, the airline industry reduced passenger space because jet fuel costs began to spike. The reduction in space was pushed in an effort to allow room for extra seats and boost profits. Since then, the average seat pitch — the distance within the back of one seat and the back of the next — has gone from 35 inches to 31 inches. Low-cost carriers, like Acro’s customer Spirit, even reduced the pitch on many seats to 28 inches and adjusted cabin design to meet the trending demand. Unsurprisingly, the manufacturing of both airline seats and aircraft interior products make up a $17-billion industry. Although by 2021, that number is projected to rise to $29-billion as travel demand continues to surge. Clearly, airline seat contracts are a lucrative industry. A recent example involves a Middle Eastern airline that agreed to pay nearly $41 million to install economy seats in 39 of their airplanes. To offer additional knee space, many seat manufacturers and refurbishers have moved the tray tables higher up on the seat back. Further, support beams that run horizontally below the seats have been either completely removed or raised to give passengers more space for their feet. Industry experts suggest that advanced materials and designs can run 20-25% more expensive to make compared to older seats. Innovative solutions addressing the concern of aircraft seat design and more comfortable seats are constantly evolving. Last month, we shared new designs including PASSME Consortium’s Innovative Aircraft Seat which pushes together rows of seats to make additional space in the aisle. To read more about our take on the innovations in aircraft seat design, check out our article of the Crystal Cabin Awards here. 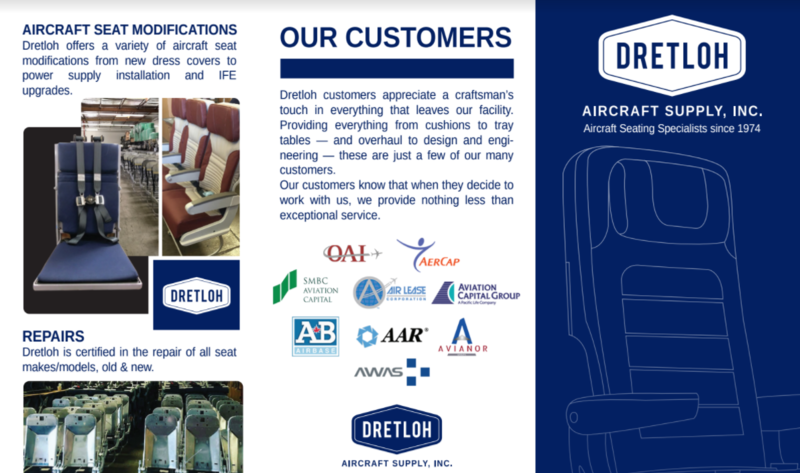 At Dretloh Aircraft Supply, seat designers work directly with engineers to provide clients with the best in overhaul services. Additionally, many of the latest technologies in slimming seats or utilizing unique materials help us to deliver a high-quality product that meets the demands of the industry. We are proud of our aircraft seat designs and encourage you to reach out to a member of our customer service team if you have more questions about what we offer.